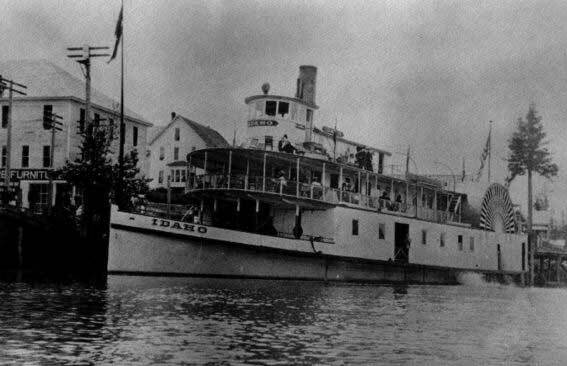 From about 1878 until the mid-1930s, Coeur d'Alene Lake in Idaho had possibly the largest number of steamboats anywhere. The book, Steamboats in the Timber, by Ruby El Hult, tells their story. 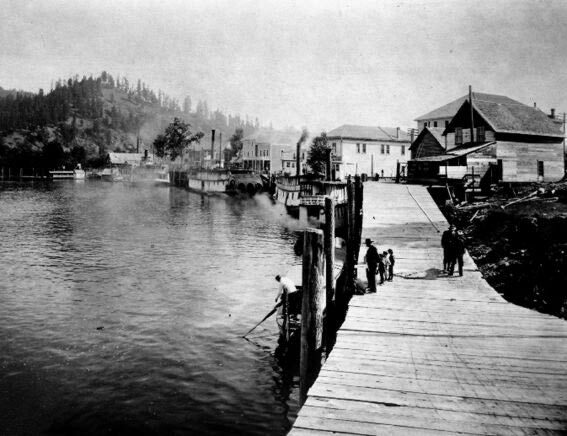 This photo shows Coeur d' Alene, Idaho, at the turn of the century. Lewis and Clark discovered Idaho in 1805, David Thompson, a British fur trader, built the first trading post on Pend Oreille Lake in 1809, Father Pierre-Jean DeSmet, a Jesuit missionary, established a mission in 1842 among the Coeur d'Alene Indians. General William T. Sherman paused by the Coeur d'Alene Lake in 1877 when he was traveling through the West inspecting forts. Fort Coeur d'Alene was built in 1878. They changed the name to Fort Sherman in 1891 when General Sherman died. The docks at St. Maries, circa 1910. St. Maries is about fifteen miles above Ceour d'Alene Lake, where the St. Maries River joins the St. Joe River. The book Steamboats in the Timber describes the founding and growth of the river town. This photo shows several boats: the Idaho (sidewheeler), the Georgie Oaks (a large covered sternwheeler), the Spokane, and the Schley. The Schley was named for a Spanish-American war hero and got its machinery from the General Sherman in 1899. After giving up its machinery, they towed the Sherman hull to the Coeur d' Alene lake and sunk it. The Ceour d'Alene Press published this obituary: "Steamer General Sherman, in the crystal waters of Coeur d'Alene lake you were christened and to her waters we consign you." 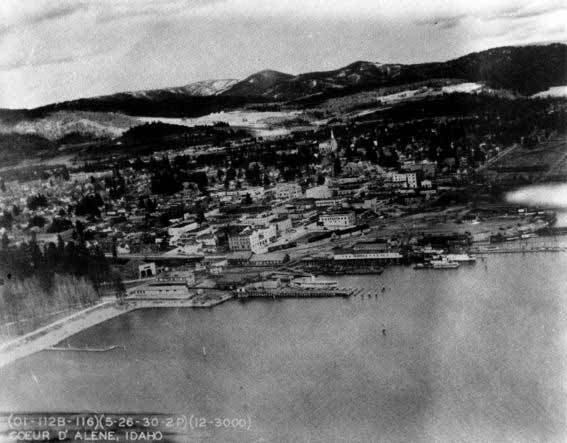 This is the Idaho on Lake Coeur d'Alene, circa 1914. 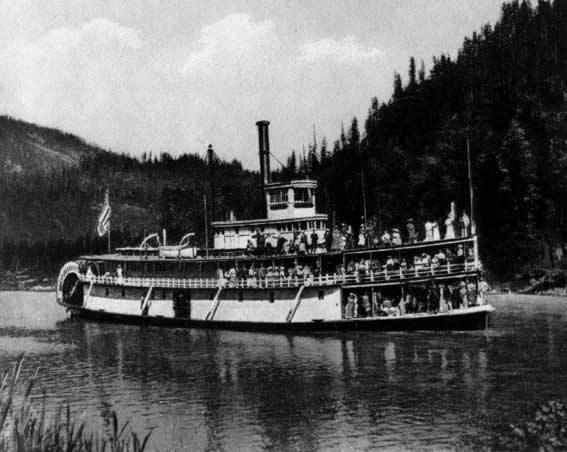 Notes from Steamboats in the Timber: "The Idaho was a side-wheeler, one hundred and forty-seven feet long with a twenty-tree foot beam, capable of carrying one thousand passengers. Her two wheels were each twenty-one feet in diameter and she had an eight-hundred horsepower dynamo which gave power for one hundred and twenty-five lights. On the first deck was a buffet; on the middle deck were the restrooms, purser's office, two cabins; on the upper deck were two cabins and a wheelhouse. The whole interior was elaborately furnished; and although the Georgie Oakes was still the longest boat on the lake, the Idaho was now the most palatial and had the greatest carrying capacity. She made her first run to St. Maries with two hundred and fifty passengers, and immediately became the most popular boat on the lake. Her weekday schedule was especially arranged to connect with the Electric Line and to give fast service on the lake and up the St. Joe. On Sundays she took hundreds of people to St. Maries on excursion" (pp. 144-145). The Harrison, named for the City of Harrison (not to be confused with the tugboat Harrison, built earlier). 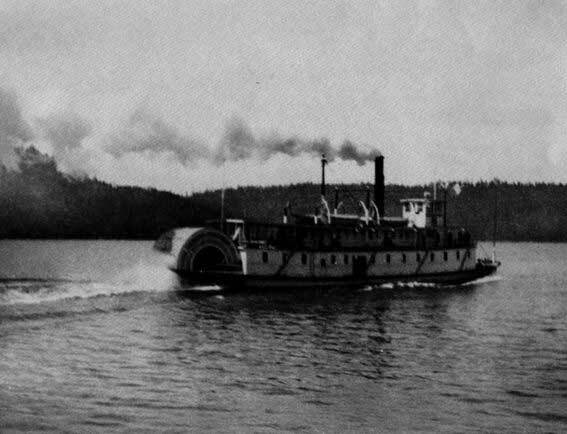 From Steamboats in the Timber: "The Harrison met the trains from the mines at Harrison, made a picturesque trip down the lake to Amwaco, and there connected with special trains taking passengers directly to Spokane. Since this was a quick, convenient trip under the direction of one company, eliminiating extra ticket buying and schedule reading, it was soon the most popular route in and out of the mining country, and the Harrison took $80,000 a year away from the Red Collar Line. A new feud began. Or rather, the old feud revived under slightly different circumstances, for George Reynolds, archenemy of the Red Collar Line from White Star Navagation days, became captain of the Harrison" (pp. 168-169). Steamboats in the Timber goes into great detail about the relationships of the various steam lines and train lines of the era. This is the Georgie Oakes at St. Maries. 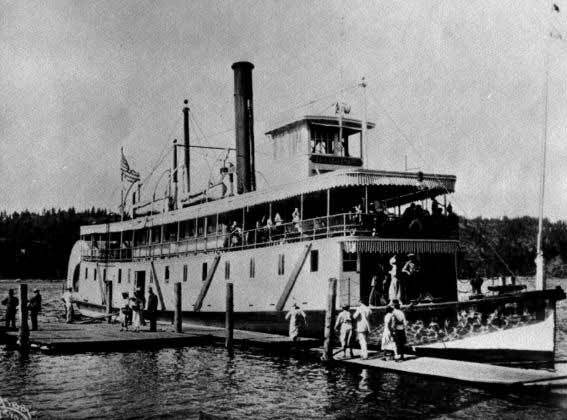 From Steamboats in the Timber: "In 1890 the old steamer Coeur d'Alene, which could haul but fifty tons of ore, was abaondoned and part of her cabins and superstructure placed on a new hull with a carrying capacity of one hundred tons, built by Sorensen and Johnson on Sanders Beach. 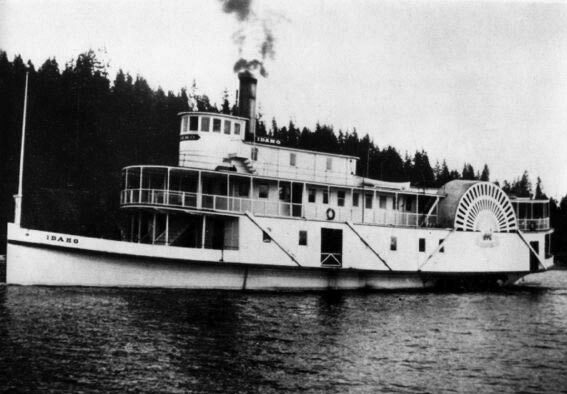 This new stern-wheeler, the Georgie Oakes - named after a daughter of the president of the Northern Pacific Railroad - was put on the Coeur d'Alene's old run to the Mission, and for a short time hauled out prodigious quantities of ore from the Coeur d'Alene mining region" (pp. 39-40). Here is another shot of the Georgie Oakes on Lake Coeur d'Alene. Steamboats in the Timber recounts a breath taking race between the Georgie Oakes and the Harrison. At first the Harrision was ahead, but according to an article quoted from the Coeur d'Alene Press, the captain of the Oakes declared to the passengers, "We'll win this race yet if you'll take your hats off and yell loud if we catch up to them." When the Oakes passed the Harrison, the passengers yelled and all the passengers on the Harrison went into hiding out of shame. The Oakes widened its lead to 200 yards to win the race the boat retained its supremacy on the lake to the end (ref. pp. 169-171). Steamboats in the Timber describes a pair of swallows that built a nest under her guardrail: "Each morning before the departure of the boat the mother swallow darted into her nest and went along on the trip. The male swallow remained in Coeur d'Alene and toward evening flew out as far as two miles across the water to meet the boat and join his mate" (p. 186). Another view of the Harrison. 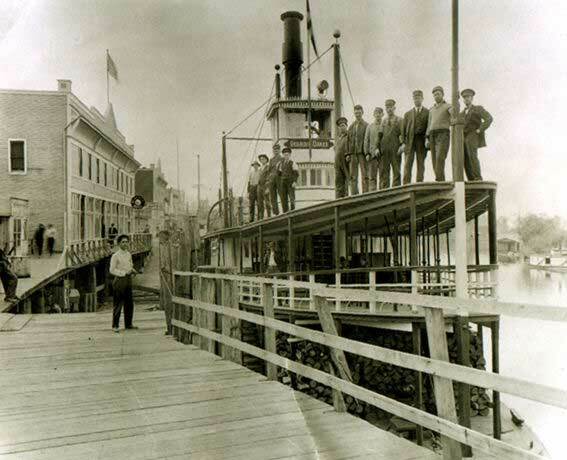 From Steamboats in the Timber: "The big Harrison ran until the early twenties, then burned at Brautigam's dock in Coeur d'Alene. . . . In the 'steamboat graveyard' at Three-Mile Point ended the hulls of several boats, among them the Colfax, Harrision (after it burned), and the guts Samson, St. Maries, and Bonanza. At low water three of these old hulls can still be seen sticking from the lake - like ghosts out of some almost forgotten past" (p. 185). This is the Flyer on Lake Coeur d'Alene. From Steamboats in the Timber: "In spite of difficulties and rivalry, the White Star Navigation Company grew. They bought from Carscellan Brothers the freight boat Telephone. In 1906 they added the one-hundred-and-thirty-foot Flyer. And in 1908, when the Northern Pacific condemned the old Georgie Oakes as unseaworthy, they bought her cheap, and, expending $10,000 for repairs and renovation, made practically a new boat of her. The Flyer was built by Johnson, and it was generally agreed that she was his masterpiece" (pp. 147-148). "The Flyer, under the captainship of Claude Barnes, continued to run to St. Maries until 1935. For some years she made two trips weekly and a Sunday excursion trip. Finally she made Sunday trips only. In 1938, Potlatch forests, owners of both the Flyer and the Clipper, decided they had no further use for the two boats and deliberately burned them on the lake" (p. 185). There is much more information available about the construction and operation of this boat in Steamboats in the Timber. This is the Idaho at St. Maries in 1910. 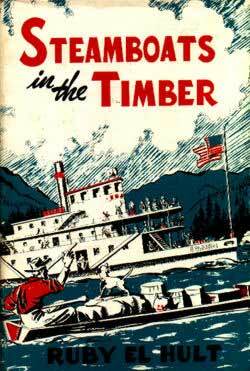 From Steamboats in the Timber: "Fire, too, claimed the big side-wheeler Idaho. This boat had been retired from active use and taken to Blackrock, a bay on the lake where a big apple orchard was located. The hull was used as a sorting and storage shed during apple harvest. In 1915, with a cargo of apples aboard, it burned to the water line and sank in the bay" (pp. 184-185). The Georgie Oakes, circa 1910. 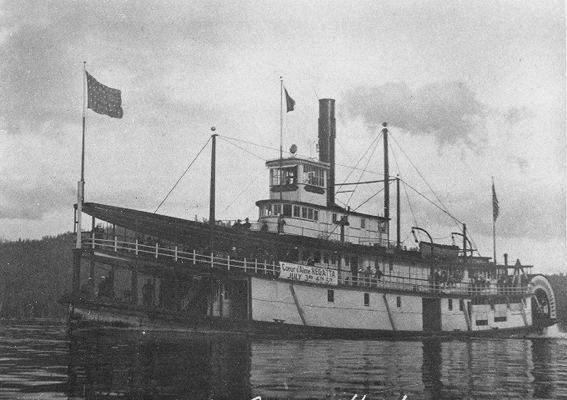 After winning the steamboat race with the Harrison, she was the First Lady of the lake for thirty years. End of the Georgie Oakes: "The Georgie Oakes made daily runs until 1917 when the Miss Spokane was built; then until 1920 she was used only intermittently. As part of the Fourth-of-July celebration in 1927 she was burned on the Coeur d'Alene water front. Lumps rose in many throats as flames ate at the vessel. 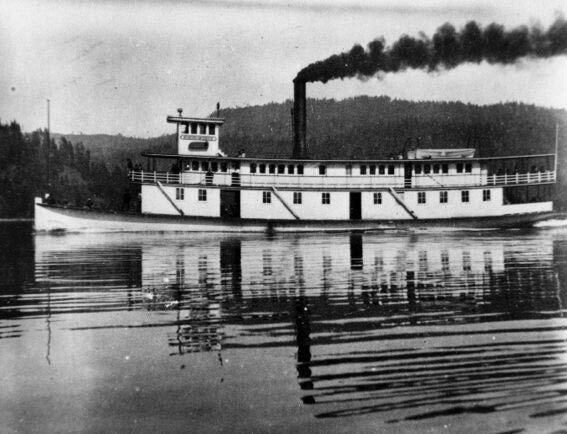 As an ore hauler, freight hauler, passenger boat, excursion steamer, she was a symbol of history on Lake Coeur d'Alene; to see her destroyed was to see the old days pass, never to be recaptured" (pp. 186-187). Steamboats in the Timber by Ruby El Hult. Amazon can try to find a used copy for you, as this book is sadly out of print. Click here to go to the Museum of North Idaho website. Steamboats.com thanks Jeffrey Davis for sending these photos and the book, Steamboats in the Timber.